Linden tea what is it good for? Ketogenic diet menu for easy weight loss health Linden tea what is it good for? Old Slavs knew about the powerful healing properties of flowers and bark of this plant long before modern medicine, in particular, lime tea has been used as a cure for various ailments such as headache, flu, anxiety and gastric conditions. In traditional European medicine linden - Latin name Tilia platyphyllos has been used for centuries in the treatment of various health problems. What was known by ancient doctors and healers is that this soothing tea promotes sweating, thanks to which they lowered high temperatures in patients, decrease the fever and shivering which is a characteristic symptoms of severe colds and flu. Since then, the linden tea for fever is generally accepted among the European nations. How was linden tea used as a cure? It is known that the ancient Slavs revered it and that their habitats were around linden groves. In phytotherapy white flowers are used (Tilia cordata) and black or wild linden (Tilia), and linden tea were used particularly to relieve nervous tension and anxiety. It is a deciduous tree, which favours the moderate climate, can reach a height of 30 meters, and its life span is almost a thousand years. Linden is harvested when it starts to bloom from May to July, that is, when it opens only a third of its flowers (do not wait to bloom fully). Tea made from lime tree has a distinctive pleasant taste thanks to the aromatic oils that are found in its bloom. Linden blossom has always been used in folk medicine as a remedy to relax the nervous system, especially in the case of expressed nervousness, irritability, anxiety and insomnia. Essential oils that are made from flowers have sedative properties, but also reduce muscle spasms. Many conducted researches show that inhalation of these oils relaxes the nervous system. Also, linden has a beneficial effect in the case of headaches caused by inflammation of sinuses and migraines. Tea made from lime tree can be drunk by children, and can be used as an additive to baths for babies against cramps. Herbalists recommend it to women in menopause to relieve symptoms such as anxiety and insomnia, it has a beneficial effect, solves problems associated with premenstrual syndrome. 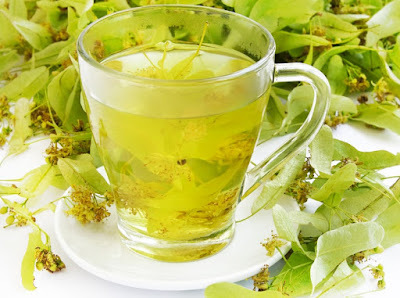 A mild tea made from linden during pregnancy with the addition of a teaspoon of honey is not forbidden, it is similar to chamomile tea, cranberry, nettle or bar. However, if you are pregnant, talk with your doctor about the dosage of this beverage. Do not exaggerate in any case, drink moderate amounts. Lime tea has a beneficial effect in the case of arteriosclerosis (closure of arteries) and hypertension, but many experts point out its beneficial effects against other cardiovascular ailments. British herbalist Simon Mills, said that flowers of linden have a healing effect on the blood vessel walls and even mitigate the symptoms of varicose veins. In addition, the French father of phytotherapy Henri Leclerc said in his papers that this plant acts as an anticoagulant preventing blood clotting. It is important to note that people who use drugs to control blood pressure should not drink lime tea due to side effects that can cause. Thanks to its detoxifying capacity, linden flower causes sweating, lowers fever by acting simultaneously as an antiseptic, and is therefore used in the treatment of flu and various infections. It also helps in the case of nasal congestion, sore throat and cough. Tea made from the inner bark of linden encourages the flow of bile and liver, and promotes detoxification of the whole organism. In addition, medicinal tea from lime tree proved to be an excellent solution against cellulitis (inflammation of the skin with symptoms of irritation and swelling) by suppressing the bacteria that causes the disease. If you replace coffee with lime tea you will cope with stress much easier, and make it easier to fall asleep. The basic recipe for lime tea is very simple, it is necessary to take up to two teaspoons of dried lime flower and cover them with two and a half decilitre of boiling water. Remove the cup to the side and top the cover. Flip it open after five and a maximum of ten minutes later, filter it well and drink it while it is still warm. Feel free to drink lime tea several times a day, if necessary, sweeten it with good honey. However, do not overdo it, because larger quantities of this drink can cause certain side effects. Linden tea with a teaspoon of honey is an excellent prevention of pneumonia, sinus and throat inflammation, it works extraordinary on the bladder and kidneys, and helps prevent urinary infections. Linden flower is used with many tea blends, here are some of them. Mix 25 grams of lime flower, 25 grams of elder, 25 g of chamomile flowers, 15 grams of nightshade and 10 grams of white soapwort, three tablespoons of the mixture pour with five dl of boiling water and let it sit for 60 minutes, be sure to cover it. Filter and drink it warm. Mix 30 g of lime flower, 30 grams of chamomile flowers and 10 grams of agrimony, rose flower, teucrium chamaedrys and rose hip. Three tablespoons of this mixture pour with 5 dl of boiling water, tilt and let it rest for an hour. Filter and drink lukewarm during the day. Pour 100 grams of flower or linden bark with a litre of boiling water, cover and leave to stand for three hours, then filter it. Soak a piece of gauze or cotton cloth and tighten it to the affected area (for burns and wounds). Pour six tablespoons of lime flowers with a litre of boiling water and let it sit for more than an hour to stand covered. Filter and sweeten to taste with local honey, and drink during the day moderately in small sips. Soak two handfuls of lime flowers (without leaves) in one litre of cold water and let it sit in a dark and cool place for up to two days. Then drain well, pour into a suitable enamel saucepan, add 800 grams of cane sugar and heat until it boils, with constant stirring. When it boils, remove from heat and leave aside to cool, then add freshly squeezed lemon juice and mix well. Pour linden syrup in a glass bottle and refrigerate. Take it every day three times a day one tablespoon of medicinal syrup, half an hour before meals. Pour five tablespoons of linden flowers with a litre of boiling water and leave it covered to rest for at least an hour. Strain and add to the healing bath. Apply every evening one hour before bedtime. Pour three tablespoons of finely chopped dry bark of linden with five dl of boiling water and leave it well covered to stand for a minimum of one hour, then filter it, add a squeezed lemon juice and drink moderately during the day in small sips.